RUSH: Earlier today, the Senate Intelligence Committee -- which is chaired by a Republican, Burr, from North Carolina. The ranking Democrat is Mark Warner of Ralph Northamville. They issued a report claiming that they found no evidence whatsoever of any collusion between Russia and Trump. Zilch, zero, nada. "After two years and 200 interviews, the Senate Intelligence Committee is approaching the end of its investigation into the 2016 election, having uncovered no direct evidence of a conspiracy between the Trump campaign and Russia, according to both Democrats and Republicans on the committee." This has caused abject meltdown through much of the Drive-By Media. MSNBC is stunned by the news from the Intelligence Committee. They're worried Trump's gonna claim vindication, and he's gonna be right! This is crazy! 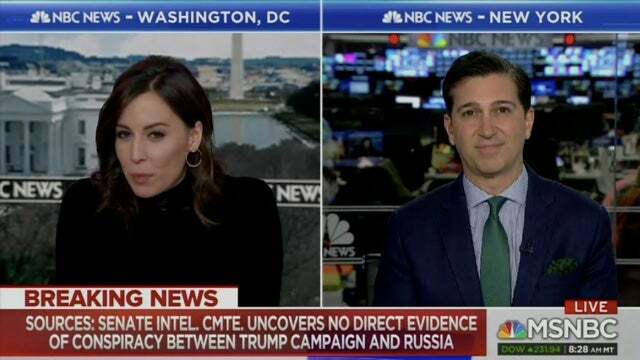 "Intelligence and national security correspondent for NBC News Ken Dilanian reported the somewhat breaking news to MSNBC’s Hallie Jackson that the Senate Intelligence Committee admits it has found, after two years, 'no direct evidence' of collusion between Donald Trump and Russia. The report met surprise first, then skepticism, with Jackson and her guests." They are beside themselves over this. They can't believe it. Because, remember, these people literally have talked themselves into the fact that Trump stole the election working with Russia, despite how literally insane that is given what everybody knows what really happened here with the dossier, the Hillary Clinton campaign, the FBI, DOJ, the Obama intel agencies. Everybody knows what happened. Especially they do. But they have gotten so into this story, they really believed it.